I'm a sentimental person. 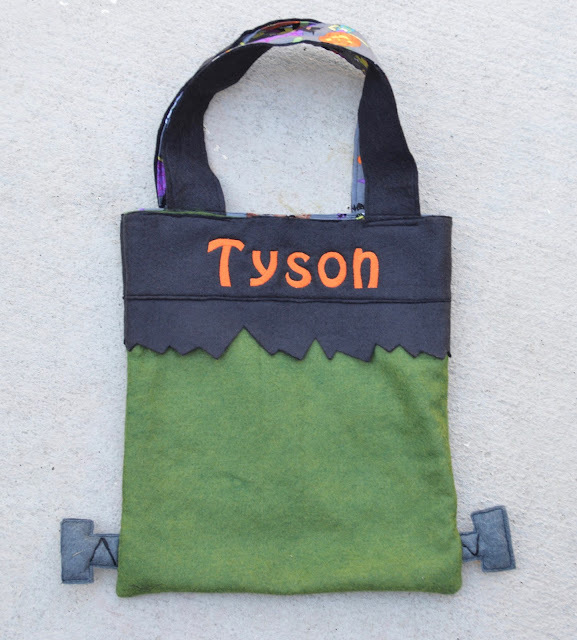 I remember when I was 7 or 8 years old, my Nana made me a witch Trick-or-Treat bag and I thought it was just the coolest thing in the world. So cool in fact, I still have it with my other Halloween decorations. Having something that's made specifically with you in mind is special and so much more meaningful (to me at least) than anything store-bought. Now I'm fully aware that when Ty gets a little older, he's going to probably want to trade out his Frankenstein Trick-or-Treat bag with a pillow case because hellllooooo way more candy! Until then, I'm going to soak up watching him running around with his toddler size bag saying Trick-or-Treat to everyone he passes. 2. I found some cute Halloween fabric and lined the bag and straps with it to make it more durable....and cute! 3. 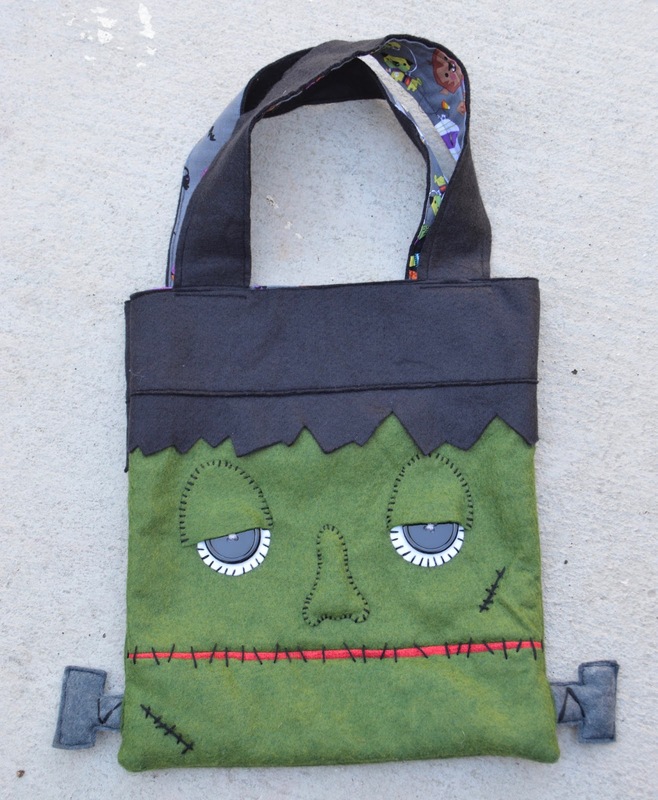 I added bolts on the side of the bag because Frankenstein to me isn't complete without them right?! To do this I just cut 4 T shaped pieces from grey felt, sewed them together and stuffed with fluff. For more detail I took some of the black embroidery floss I used for the face details and just stitched some lines to make it look more like bolts. 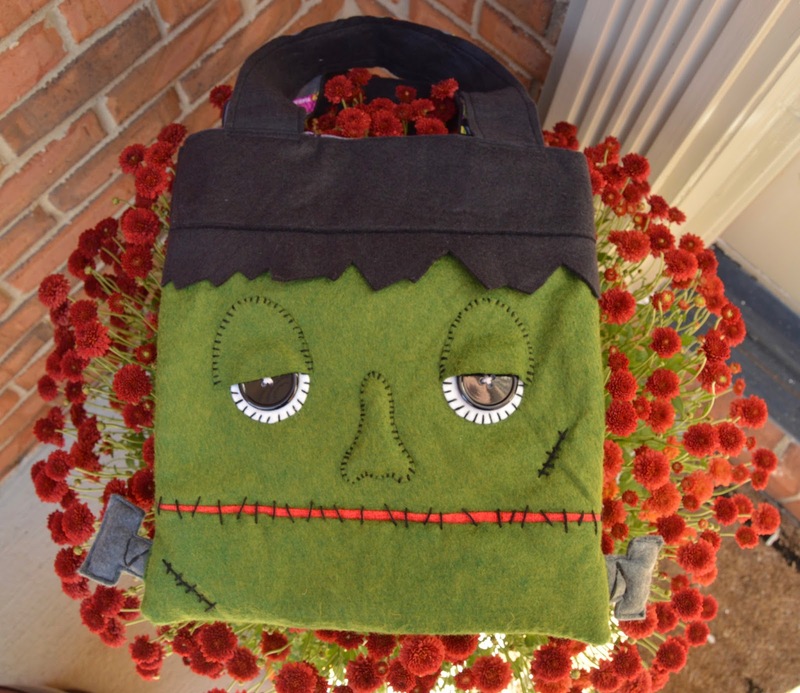 To finish, sew them in when you put the right faces of the bag together. This is so stinking cute! You're such a fun and crafty mom!